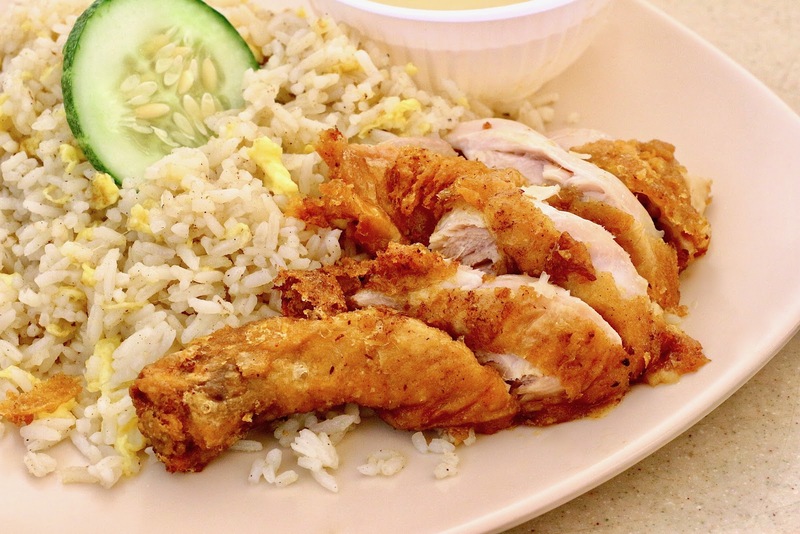 A 100% Muslim-owned establishment, Aspirasi specializes in chicken rice. However, don’t expect your usual steamed or roasted chicken here. At Aspirasi, chicken marinated for 4 hours is freshly fried upon order and served with your choice of homemade sauces – lemon, black pepper, sambal and sweet and sour. For the purists, they also have chicken rice without any sauce ($3.50) – fragrant rice grains cooked hainanese style and served with a piece of fried chicken, soup and their signature homemade chilli. Besides that, Aspirasi also offers Fried Rice with their signature fried chicken ($5) and Fried Rice Tomato with Sambal Chicken ($5.50). The bunch of golden brown fried things you see in the middle? This has got to be Aspirasi’s pièce de résistance. Placed in a large bucket at the storefront, diners can take however much they want as an accompaniment for their chicken rice. These fried flour bits though deep fried in hot oil, was light and crispy and thankfully not overly oily. Going clockwise, the sauces are black pepper, sambal, chicken rice chilli, ayam penyet chilli, lemon sauce lastly their sweet and sour sauce. The Black Pepper Chicken Rice ($4) comes with a liberal dose of thick black pepper sauce atop your choice of chicken part (just tell them which part you want!) coated with a light batter and fried. The black pepper isn’t very spicy so for those who can’t really take heat can give it a shot too! Up next is the Sweet and Sour Chicken Rice ($4). The sweet and sour sauce is unlike the kind of sweet and sour dishes we usually find at cai fan or tze char stalls. Here, it is less sweet and viscous, perfect for polishing up the rice with. If there’s one thing you haven’t yet realised, it is that Aspirasi definitely doesn’t stinge on their sauces. This Sambal Chicken Rice ($4) came with a piece of tender fried chicken breast enveloped in their signature spicy sambal sauce. This version is one of my favorites out of the lot, being a lover of all things spicy. The textural contrast of the sambal sauce, thin crisp batter and tender chicken breast under left us wanting for more. Little wonder that this is a crowd favorite! The Fried Rice with Chicken ($7) is great for those who are starving with the generous portion of fried rice cooked with eggs and herbs. Diners can ask for any choice of sauces to top their fried chicken here. One of their bestsellers, the Chicken Rice, Penyet ($5) is served with a homemade chilli sauce with a kick. Diners who like their stuff spicy should definitely go for this option. Nevertheless, the level of heat for their chilli sauces have been reduced on the whole, in order to cater to the tastebuds of their customers. Although the lemon sauce is completely non-spicy and suitable for people who don’t take spice, we suggest giving it a skip as it tasted a tad too sweet and artificial for our liking. With their quick friendly service, hearty portions and affordable prices, Aspirasi attracts a steady stream of diners throughout the day. Owner Razak Abdullah tells us that on a busy day, he can sell up to 20 cartons of chicken a day at their flagship outlet at Seah Im Food centre. What we enjoyed from Aspirasi was the friendly staff, efficient service and last but not least, free flow chicken rice accompaniments – chicken rice chilli and fried flour bits! Besides this outlet, they have another outlet at Maxwell Food Centre and another Western food stall at Seah Im Food Centre (Aspirasi Iron Plate, #01-39). They also do catering services for various functions like weddings and events.